At some point, you have to fall for Susan Sarandon. 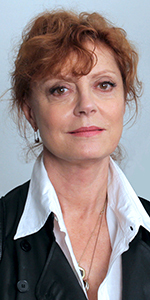 Intelligent and vivacious, with a steely quality, Sarandon is no fool, that's for sure. She has acted in an array of projects from big pictures to independent projects, and has done a great deal of activism. Sarandon was born the oldest of nine children in Queens, New York. As the family enlarged, they moved to Edison, New Jersey, where Susan graduated Edison High School in 1964. Attending The Catholic University of America in Washington D.C., she studied acting with Father Gilbert V. Hartke. She graduated in 1968. Going to a casting call for a movie and hoping to get a small role, Sarandon wowed director John Avildsen, who cast her in a pivotal role in Joe (released in July, 1970) with Peter Boyle. She then did a bit of globe hopping, appearing in the low-budget Canadian film Fleur bleue - AKA The Apprentice (released in September, 1971), then went to Italy to appear in the comedy La mortadella - Lady Liberty (released in December, 1971) with Sophia Loren. Proper Hollywood agenting got her roles in Lovin' Molly (released in April, 1974) with Anthony Perkins, and the thankless role of Peggy in Billy Wilder's remake of The Front Page (released in December, 1974) with Lemmon and Matthau. She got third billing in The Graet Waldo Pepper (released in March, 1975) with Robert Redfford, then starred as Janet in the film which, though a flop initially, later became a huge success on the Midnight Circuit, The Rocky Horror Picture Show (released in September, 1975) with Tim Curry. Still finding her way, Sarandon had a role in the Sidney Sheldon potboiler The Other Side of Midnight (released in June, 1977) with Marie-France Pisier. She then worked with French director Louis Malle in Pretty Baby (released in April, 1978) with Brooke Shields (back when Paramount financed stuff like that), then took a role in the crime film King of the Gypsies (released in December, 1978) with Eric Roberts. She reteamed with Malle for Atlantic City (which premiered at the Chinese in April, 1981) with Burt Lancaster, then starred as the Ariel character in a modern-day film of the Tempest (released in September, 1982) with John Cassavetes and Gena Rowlands, then played a gerontologist trying to help David Bowie in The Hunger (released in April, 1983). Sarandon played Livilla in the mini series A.D. aired over the History Channel in March and April, 1985, and Edda Mussolini Ciano in Mussolini and I, aired over HBO in September, 1985. She scored bigtime with The Withches of Eastwick (released in June, 1987) with Jack Nicholson, and Bull Durham (released in June, 1988) with Kevin Kostner. Sarandon joined the cast of A Dry White Season (released in September, 1989) with Donald Sutherland (back when MGM financed stuff like that), and turned many heads by starring as the older woman in White Palace (released in October, 1990) with James Spader. For many, the Sarandon package all comes together in Thelma & Louise (released in May, 1991) with Geena Davis. The elegantly told tale of two women needlessly on the run made her and Davis worldwide icons. She played a newscaster in Bob Roberts (released in September, 1992) with Tim Robbins, and worked with Witches director George Miller once again in Lorenzo's Oil (released in January, 1993) with Nick Nolte. For her trip into John Grisham territory, Sarandon finally got top billing in The Client (released in July, 1994) with Tommy Lee Jones, then played the mother, Mrs. March, in Little Women (released in December, 1994) with Winona Ryder. She played Margherita Sarfatti in Cradle Will Rock (released in May, 1999) with Hank Azaria, and played an impulsive mother to Natalie Portman in Anywhere But Here (released in November, 1999), and did the comedy The Banger Sisters (released in September, 2002) with Goldie Hawn. She played tobacco heiress Doris Duke in Bernard and Doris (released in September, 2006, then aired over HBO in February, 2008), did six episodes as Alicia Green on Rescue Me aired over FX in August, 2007, and starred in In the Valley of Elah (released in September, 2007) with Tommy Lee Jones. Sarandon entered the Disney empire with Enchanted (released in November, 2007) with Amy Adams, then played the title characters' mother in Speed Racer (which played the Chinese in May, 2008) with Emile Hirsch, and starred in the family drama The Greatest (released in January, 2009) with Pierce Brosnan. Sarandon played the mother of twins Edward Norton (in a double role) in Leaves of Grass (released in September, 2009) with Edward Norton, played Shia LaBeouf's mom in Wall Street: Money Never Sleeps (released in September, 2010), and played Jason Segal's mom in Jeff, Who Lives at Home (released in September, 2011). In Robot & Frank (released in January, 2012), Frank Langella tries to swipe a rare book from Sarandon's librarian Jennifer. She played Richard Gere's unsuspecting wife in Arbitrage (released in September, 2012), and did six episodes of The Big C with Laura Linney airing over Showtime in June, 2012. She played an ex-Weather Underground member in The Company You Keep (released in April, 2013) with Robert Redford, she played multiple roles in the complex telling of Cloud Atlas (released in October, 2012) with Tom Hanks, and played the current girlfriend of Robert De Niro in The Big Wedding (released in April, 2013). She playes a loose-cannon mom to Rose Bryne in the drama The Meddler (released in September, 2015), played a New York dectetive in Ace the Case (released in August, 2016) with Ripley Sobo, and played Bette Davis to Jessica Lange's Joan Crawford in the mini series Feud which premiered at the Chinese in March, 2017, then aired over the FX Network). She joined the ensemble comedy A Bad Mom's Christmas (released in November, 2017) as Kathryn Hahn's mother, and played studio head Samantha Winslow on 19 episodes of Ray Donovan aired over Showtime beginning in August, 2017. Mann's Chinese Theatre, Hollywood, California. Susan Sarandon Forecourt ceremony, Monday, January 11, 1999. Susan Sarandon gives a winsome smile while placing her hands in the cement. Photo by WENN / Marcus Hoffman.